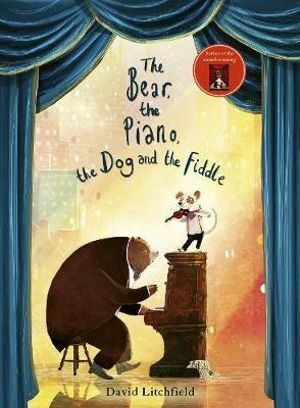 Written and illustrated by David Litchfield, The Bear, The Piano, The Dog and The Fiddle is a sweet story about friendship and music, which will appeal to children and adults alike. Hector had a dream of being a famous fiddle player, but it was not to be, and eventually he retired. Then Hector discovers his good friend Hugo the dog is a 'toe-tappingly, finger-clickingly, whistle-blowingly awesome' fiddle player, Hector is surprised, but teaches Hugo all he knows. Hugo's talent is acknowledged with an invitation from Bear to tour the world making music. Sadly, Hector is disappointed that he missed the same opportunity, but encourages Hugo to make the most of it, although at the last minute Hector says something that upsets his friend. Hector and Hugo don't see each other for a long time after their disagreement, leading Hector to worry that he has lost his best friend. But Hugo is a very good friend and manages to surprise Hector again, and proves that their friendship is just as important and special as music. David Litchfield's illustrations are full of detail and use a wonderful colour palette, somehow seeming to draw you into the pages. The Bear, The Piano, The Dog and The Fiddle shares the ups and downs of friendship in a way that is easy for young readers to understand, and will be enjoyed by the whole family.